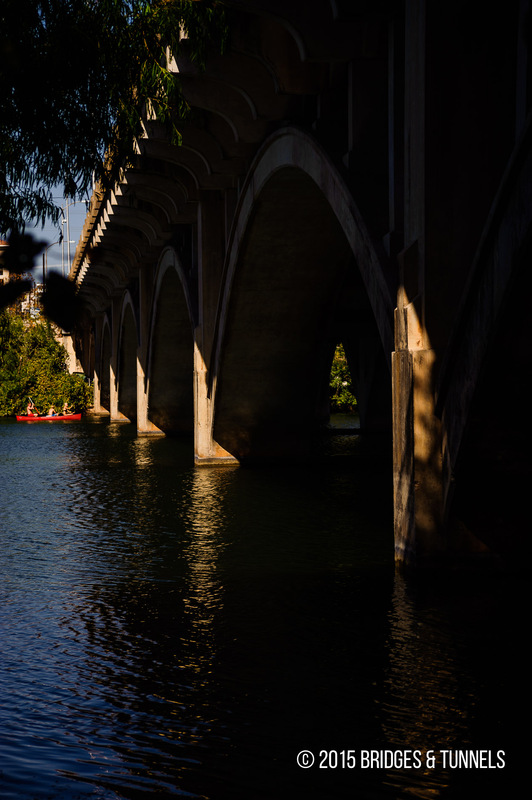 The South Lamar Boulevard Bridge in Austin, Texas, with its six open spandrel concrete arches,1 spans Lady Bird Lake. 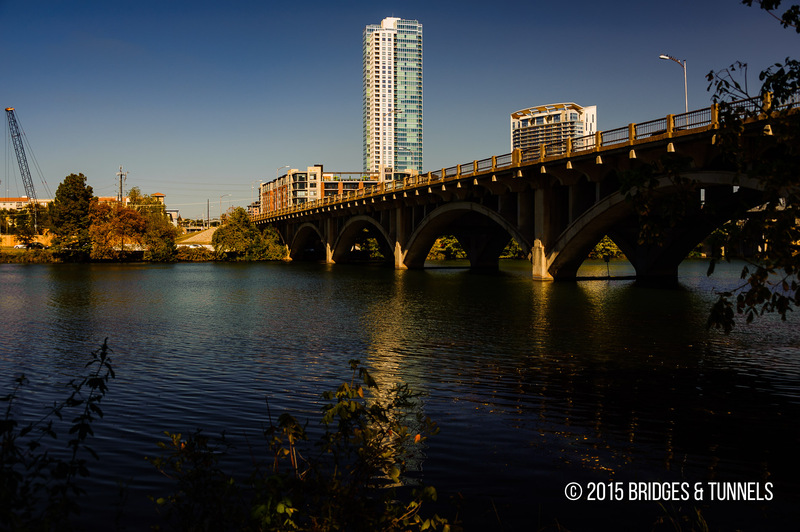 Constructed from 1940 to 1942,2 the bridge was the second permanent bridge to cross the Colorado River in Austin. Significant growth in Austin, especially south of the Colorado River, resulted in the South Lamar Boulevard Bridge becoming overburdened. Featuring ten-foot traffic lanes, narrow sidewalks and no provisions for cyclists, has led discussions on its rehabilitation or replacement. “Lamar Boulevard Bridge.” Historic Bridge Foundation. N.p., 2003. Web. 7 Nov. 2012.Article. James D. Pfluger Pedestrian and Bicycle Bridge. N.p. : n.p., n.d. Scribd. Web. 7 Nov. 2012. Report. American Association of State Highway Transporation Officials (AASHTO), Standard Specifications for Highway Bridges, 16th Edition, 1996, with Interim Updates through 1998. American Association of State Highway Transporation Officials (AASHTO), Guide Specifications for Design of Pedestrian Bridges, August 1997.3. American Association of State Highway Transporation Officials (AASHTO), Guide Specifications for Horizontally Curved Highway Bridges, 1993, with Interim Updates through 1995.4. National Steel Bridge Alliance (NSBA), “V-LOAD Analysis,” Highway Structures Design Handbook ,Volume 1, Chapter 12, pg. I/12/16, December 1996.5. Bridgesoft, Inc., “STLBRIDGE – Design of Continuous Steel Bridge Girders,” Omaha, Nebraska, 1997.6. Bridge Software Development International, Ltd. (BSDI), “Bridge-System (SM), 3D System,”Coopersburg, Pennsylvania, 1987.